India Mauryan Empire - HISTORY'S HISTORIESYou are history. We are the future. 3. Government: How do humans organize their societies, and why do they organize them the way that they do? The Mauryan Empire: After the Aryans entered northern India from the Caucasus, the next thousand years saw a great many kings and emperors rise to power! Some did fabulous things, like plant trees along the roads and build rest houses for travelers. Others started great public works programs. For this lesson, you will take a closer look at one of the greatest, the Mauryan Empire (also known as the Maurya Empire) and focus on the time it was led by Ashoka the Great. What will you be able to do? You will be able to interpret the edicts written by Ashoka of the Mauryan Empire and explain how his edicts helped unify India. What idea, topic, or subject is important for you to learn and understand so that you can do this? You will learn about the Mauryan Empire and how Ashoka the Great helped to unify ancient India. What will you do to show that you know this? You will show what you know by creating a billboard interpreting one of Ashoka's edicts, complete a graphic organizer on some of Ashoka's edicts, and answer comprehension questions about how they helped unify ancient India. Who founded the Mauryan Empire? The Rise of the Mauryan Empire and the First Unification of India: After the decline of Harappan civilization around 1900 BCE, Aryan India saw the rise of many small kingdoms. As rulers used up their resources fighting one another for wealth and power, however, these kingdoms weakened. Around 322 BCE, a nobleman named Chandragupta Maurya took advantage of this situation and overthrew the unpopular ruler of an eastern kingdom called Magadha. Over the next 24 years, Chandragupta's army of 9,000 elephants and 700,000 soldiers conquered all of northern India. Chandragupta set up a strong central government and personally oversaw most government matters. He controlled his empire through strict laws, a strong army, the use of torture, and a vast network of spies. Chandragupta was so afraid that his enemies would enter his palace and kill him that he slept in a different bed every night and had his servants taste his food before he ate it. After Chandragupta's death in 297 BCE, his son Bindusara took over and ruled for 30 years. When Bindusara died, he was succeeded by his son, Ashoka, known to history as "Ashoka the Great." How did Chandragupta Maurya control his vast empire? Ashoka and His Conversion to Buddhism: King Ashoka ruled the Mauryan Empire from approximately 269-232 BCE. It was during Ashoka's reign that the Mauryan Empire reached its peak. As a child, Ashoka studied Hinduism, had lessons on how to govern effectively, and took part in royal activities like hunting. As a teenager, he gained valuable leadership skills by governing the outlying regions of Taxila and Ujain. What event led Ashoka to convert to Buddhism? Shortly after becoming king in 269 BCE, Ashoka fought one of history's bloodiest wars. In his conquest of the neighboring kingdom of Kalinga, Ashoka's troops killed over 150,000 Kalinga warriors and suffered 100,000 casualties of their own. Despite his success on the battlefield, the terrible brutality and bloodshed that were a part of Ashoka's victory at Kalinga horrified him. As a result, Ashoka began to question if gaining land was worth the death or enslavement of hundreds of thousands of people. The war inspired Ashoka to reject violence and, around 258 BCE, he converted to Buddhism. Ashoka tried to practice Buddhist values in both his personal and political life. To demonstrate his respect for all living things, he gave up hunting, did away with royal banquets that required the killing of many animals, and became a vegetarian. He traveled to holy Buddhist sites and preached Buddhist values to people along the way. Additionally, Ashoka gave up fighting wars of conquest and encouraged his people to treat one another respectfully. Not all of Ashoka's work reflected his Buddhist values, however. As was typical of a ruler for his time in history, he neither abolished slavery in his kingdom nor did away with the death penalty as punishment for crime. He also continued to keep a strong army and kept all of the lands that he had acquired through conquest. The map above shows the extent of Ashoka's empire and the placement of his edicts. Ashoka's Edicts: Ashoka's goal was to create a strong empire whose citizens would be guided and united by the knowledge and practice of Buddhist principles. 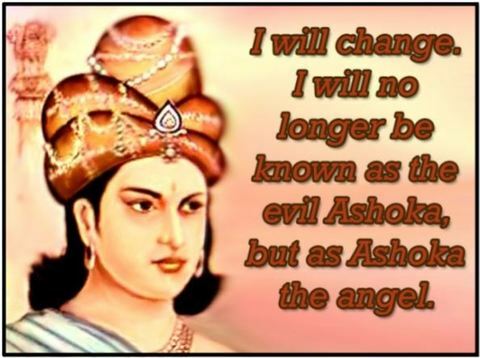 One of the ways Ashoka spread these values was through his edicts. An edict is an official order, proclamation, or command issued by a person in authority. Ashoka's edicts, or messages, were carved on cave walls, in stone, and on towering pillars throughout his kingdom. These edicts were located where the greatest number of people would see them - near larger cities, along major roads, and at important religious locations. Ashoka's edicts urged his citizens to act morally (to know right from wrong) and to take responsibility for their actions. The edicts also described Ashoka's own efforts to live morally, to maintain peace, and to provide for his people. The most impressive looking edicts were carved into towering pillars made of highly polished stone. The pillars were made by skilled craftsmen and are decorated with detailed carvings of Buddhist symbols and animals, such as the wheel and the lion. The pillars are still admired today and rank as some of the world's most beautiful sculptures.